With the explosion of social media, electronic commerce, and the hyper-personalized web, a rapidly increasing percentage of the content served to end users is generated in real time. Users expect a fast, reliable, and personalized web experience, independent of their browser, location, device, or network. However, the very innovations that make these experiences so engaging also slow page downloads and put the quality of the consumer experience at risk. Standard content delivery network (CDN) capability includes the ability to cache files closer to end users to speed up delivery of static files. However, with dynamic web applications, caching that content in edge locations isn't possible because the server generates the content in response to user behavior. Speeding up the delivery of such content is more complex than traditional edge caching and requires an end-to-end solution that finely tunes each element along the entire data path from inception to delivery. With Azure CDN dynamic site acceleration (DSA) optimization, the performance of web pages with dynamic content is measurably improved. Azure CDN from Akamai and Azure CDN from Verizon both offer DSA optimization through the Optimized for menu during endpoint creation. Dynamic site acceleration from Microsoft is offered via Azure Front Door Service. For Azure CDN from Akamai profiles, you are allowed to change the optimization of a CDN endpoint after it has been created. 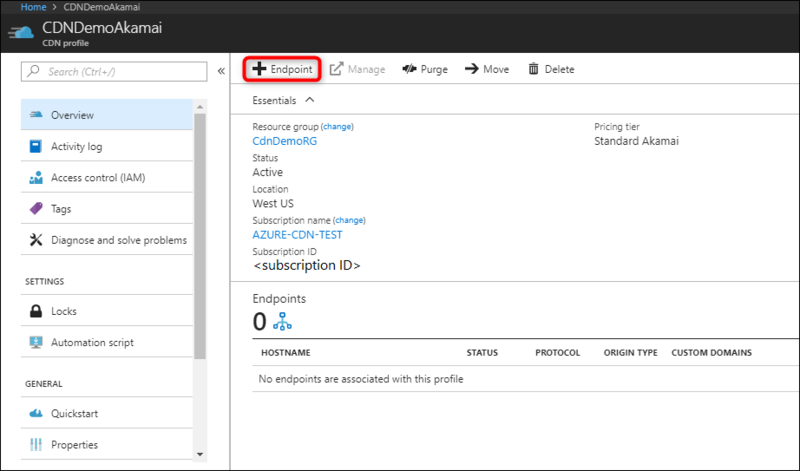 For Azure CDN from Verizon profiles, you cannot change the optimization of a CDN endpoint after it has been created. To configure a CDN endpoint to optimize delivery of dynamic files, you can either use the Azure portal, the REST APIs, or any of the client SDKs to do the same thing programmatically. In the CDN profile page, select Endpoint. The Add an endpoint pane appears. Under Optimized for, select Dynamic site acceleration. For Probe path, enter a valid path to a file. Probe path is a feature specific to DSA, and a valid path is required for creation. DSA uses a small probe path file placed on the origin server to optimize network routing configurations for the CDN. For the probe path file, you can download and upload the sample file to your site, or use an existing asset on your origin that is about 10 KB in size. Enter the other required endpoint options (for more information, see Create a new CDN endpoint), then select Add. After the CDN endpoint is created, it applies the DSA optimizations for all files that match certain criteria. In the CDN profile page, select the endpoint you want to modify. From the left pane, select Optimization. Under Optimized for, select Dynamic site acceleration, then select Save. DSA incurs extra charges. For more information, see Content Delivery Network pricing. Route optimization is important because the Internet is a dynamic place, where traffic and temporarily outages are constantly changing the network topology. The Border Gateway Protocol (BGP) is the routing protocol of the Internet, but there may be faster routes via intermediary Point of Presence (PoP) servers. Route optimization chooses the most optimal path to the origin so that a site is continuously accessible and dynamic content is delivered to end users via the fastest and most reliable route possible. The Akamai network uses techniques to collect real-time data and compare various paths through different nodes in the Akamai server, as well as the default BGP route across the open Internet to determine the fastest route between the origin and the CDN edge. These techniques avoid Internet congestion points and long routes. Similarly, the Verizon network uses a combination of Anycast DNS, high capacity support PoPs, and health checks, to determine the best gateways to best route data from the client to the origin. As a result, fully dynamic and transactional content is delivered more quickly and more reliably to end users, even when it is uncacheable. TCP slow start is an algorithm of the TCP protocol that prevents network congestion by limiting the amount of data sent over the network. It starts off with small congestion window sizes between sender and receiver until the maximum is reached or packet loss is detected. Health and bandwidth monitoring is used to measure the bandwidth of connections between edge PoP servers. Metrics are shared between edge PoP servers so that each server is aware of the network conditions and server health of the other PoPs around them. The CDN edge servers make assumptions about some transmission parameters, such as what the optimal window size should be when communicating with other CDN edge servers in its proximity. This step means that the initial congestion window size can be increased if the health of the connection between the CDN edge servers is capable of higher packet data transfers. Using a CDN, fewer unique machines connect to your origin server directly compared with users connecting directly to your origin. Azure CDN also pools user requests together to establish fewer connections with the origin. As previously mentioned, several handshake requests are required to establish a TCP connection. Persistent connections, which are implemented by the Keep-Alive HTTP header, reuse existing TCP connections for multiple HTTP requests to save round-trip times and speed up delivery. Azure CDN from Verizon also sends periodic keep-alive packets over the TCP connection to prevent an open connection from being closed. Increasing the initial congestion window so that more packets can be sent without waiting for an acknowledgement. Decreasing the initial retransmit timeout so that a loss is detected, and retransmission occurs more quickly. Decreasing the minimum and maximum retransmit timeout to reduce the wait time before assuming packets were lost in transmission. Most websites consist of an HTML page, which references various other resources such as images and scripts. Typically, when a client requests a webpage, the browser first downloads and parses the HTML object, and then makes additional requests to linked assets that are required to fully load the page. Prefetch is a technique to retrieve images and scripts embedded in the HTML page while the HTML is served to the browser, and before the browser even makes these object requests. With the prefetch option turned on at the time when the CDN serves the HTML base page to the client’s browser, the CDN parses the HTML file and make additional requests for any linked resources and store it in its cache. When the client makes the requests for the linked assets, the CDN edge server already has the requested objects and can serve them immediately without a round trip to the origin. This optimization benefits both cacheable and non-cacheable content. Some devices, especially mobile ones, experience slower network speeds from time to time. In these scenarios, it is more beneficial for the user to receive smaller images in their webpage more quickly rather than waiting a long time for full resolution images. This feature automatically monitors network quality, and employs standard JPEG compression methods when network speeds are slower to improve delivery time. With DSA, caching is turned off by default on the CDN, even when the origin includes Cache-Control or Expires headers in the response. DSA is typically used for dynamic assets that should not be cached because they are unique to each client. Caching can break this behavior. If you have a website with a mix of static and dynamic assets, it is best to take a hybrid approach to get the best performance. For Azure CDN Standard from Verizon and Azure CDN Standard from Akamai profiles, you can turn on caching for specific DSA endpoints by using caching rules. From the CDN profile page, under settings, select Caching rules. The Caching rules page opens. Create a global or custom caching rule to turn on caching for your DSA endpoint. For Azure CDN Premium from Verizon profiles only, you turn on caching for specific DSA endpoints by using the rules engine. Any rules that are created affect only those endpoints of your profile that are optimized for DSA. From the CDN profile page, select Manage. The CDN management portal opens. 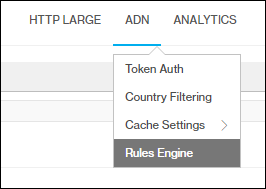 From the CDN management portal, select ADN, then select Rules Engine. Alternatively, you can use two CDN endpoints: one endpoint optimized with DSA to deliver dynamic assets and another endpoint optimized with a static optimization type, such as general web delivery, to delivery cacheable assets. Modify your webpage URLs to link directly to the asset on the CDN endpoint you plan to use.